Holiday.gr - SIFNOS, a trip to a myth! Been to SIFNOS ? Share your experiences! 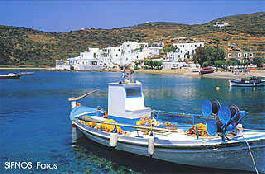 Sifnos, the island with endless natural beauties, white traditional settlements, numerous churches and hospitable people. Sifnos combines the authentic charming of Cyclades islands with its own personal identity. The island’s rich history is revealed in every path and the alteration of sceneries keep the visitors interest. Touring around Sifnos can be full of surprises and satisfies all tastes. Archaeological sites, churches, monasteries, green lands and wild hilly bulks, endless beaches and small protected coves play their own game with waves. This special island belongs to the complex of west Cyclades islands. It is located between the islands of Serifos, Kimolos and Antiparos. It has an extend of 74sq.km and a coastline of 70 km. The highest mountain of the island, Prophet Elia, has a 680m height. During the last years, Sifnos has gained big rumor. Its port, Kamares, every summer is full of travelers who come to this hospitable island to spend their holidays. In Apollonia, Sifnos’ capital, and in every village of the island, you will find hotels and rooms to let providing high standard facilities. Among others, in Sifnos you will enjoy good food. The homeland of Nikos Tselementes is famous for its traditional recipes. The most famous dishes are revithokeftedes, revithada, ampelofasoula with skordalia, revithia in the oven and capersalad.The local cheeses distinguish for their quality. Try mizithra and manoura. As for dessert prefer the local sweets. Amigdalota, voutimata, pasteli, bourekia and kourabiedes are some of those. At night Sifnos shows her other identity. In the paths of Apollonia you can find bars with greek and foreign music. While in the clubs with live music, the feast lasts till next morning.